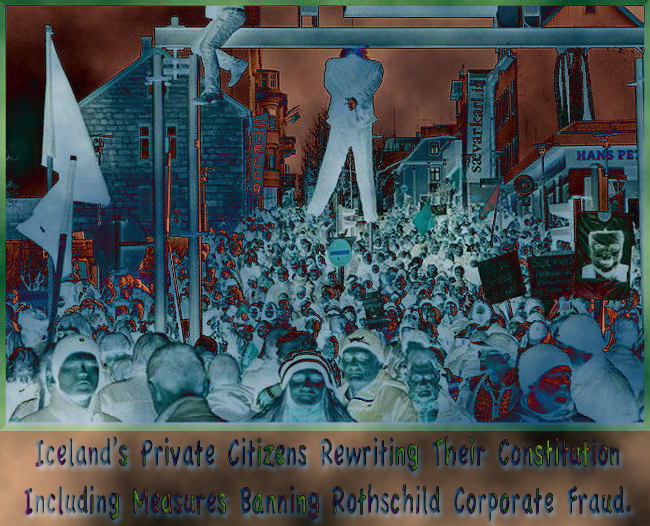 Icelanders Overthrew Corrupt Government And Rewrote Constitution Banning Rothschild Banking Fraud-No Word From US Media. Federal Reserve raises interest rates for the first time in nine years with 0.25 per cent increase. The Fed Raises Interest Rates Quarter Point. Why NOW? 2015 FOMC Monetary Policy Statement Reads Like Alice In Wonderland! 1776 GONE WILD ~ BUT IN THE NICE WILD WAY! Iceland Showed The World The Power Of The U.S. 1776 Revolution. EVERY ICELANDER’S Debt That Was concocted BY The NWO. Three years after Iceland’s banks collapsed and the country teetered on the brink, its economy is recovering, proof that governments should let failing lenders go bust and protect taxpayers, analysts say. “The lesson that could be learned from Iceland’s way of handling its crisis is that it is important to shield taxpayers and government finances from bearing the cost of a financial crisis to the extent possible,” Islandsbanki analyst Jon Bjarki Bentsson told AFP. Breaking => Iceland Sends Another Rothschild Banker To Prison For Market Manipulation. “Even if our way of dealing with the crisis was not by choice but due to the inability of the government to support the banks back in 2008 due to their size relative to the economy, this has turned out relatively well for us,” Bentsson said. Arrest Warrant Issued By Interpol For Sigurður Einarsson ~ He has now been listed on the website of the international law enforcement agency as “wanted”. The former banking executive, who lives in West London, publicly blamed Gordon Brown for Kaupthing’s collapse back in October 2008. Iceland’s implosion was organized and orchestrated along with The United State’s and other nation state collapses. Bankers felt top GDP had been achieved and that it was time to implode the system, while betting against the success of the nation state financial systems. This on a smaller scale is known as orchestrated “inside trading” which allowed convicted felon George Soros to loot $Billions of dollars. One month earlier than October 2008 this happened. Iceland’s special prosecutor issued an international arrest warrant for Mr Einarsson yesterday, with a description of him as 1.8m tall, 114kg in weight, bald and with blue eyes. According to Icelandic media reports, he has told the prosecutor’s team that he is willing to return to his home country to help with their enquiries on the condition that he is not arrested on arrival. His former co-chief executive, Hreidar Mar Sigurdsson, was arrested last week on suspicion of falsifying documents and market manipulation. He is still in police custody. Kaupthing’s collapse in October 2008 cost the British Treasury £2.5bn and hundreds of UK savers with its Isle of Man branch are still waiting to be fully compensated. Both he and Mr Einarsson have previously denied any wrongdoing over Kaupthing’s collapse. The bank’s actions are under investigation by the UK Serious Fraud Office and a special inquiry team in Iceland over claims of share ramping and big loans to related parties. Iceland’s special prosecutor is looking into more than 20 cases of potential criminal activity connected to Kaupthing and the country’s other failed banks. A special report by Iceland’s parliament showed Kaupthing secretly owned almost half of its own shares. Two-thirds of Kaupthing’s clients were based in London, including high-profile investors such as Robert Tchenguiz, Simon Halabi and the Candy Brothers, who all lost substantial sums in the crash. After Kaupthing’s loan book was leaked on to the internet last August, it showed key shareholders and owners were the bank’s main borrowers. Mr Tchenguiz, who was a director of Kaupthing’s largest shareholder, had the biggest debt of €1.74bn. France Indicts David de Rothschild For Bank Fraud: Manhunt On As Judge Orders Police To Track Down Rothschild. Since the 1900′s the vast majority of the American population has dreamed about saying “NO” to the Unconstitutional, corrupt, Rothschild / Rockefeller banking criminals, but no one has dared to do so. Why? If just half of our Nation, and the “1%”, who pay the majority of the taxes, just said NO MORE! Our Gov’t would literally change over night. Why is it so hard, for some people to understand, that by simply NOT giving your money, to large Corporations, who then send jobs, Intellectual­­ Property, etc. offshore and promote anti-Constitutional rights… You will accomplish more, than if you used violence. The truth of the matter is… No one, except the Icelanders, have to been the only culture on the planet to carry out this successfully. Not only have they been successful, at overthrowing the corrupt Gov’t, they’ve drafted a Constitution, that will stop this from happening ever again. That’s not the best part… The best part, is that they have arrested ALL Rothschild/Rockefeller banking puppets, responsible for Iceland’s economic Chaos and meltdown. It has been a revolution without weapons in Iceland, the country that hosts the world’s oldest democracy (since 930), and whose citizens have managed to effect change by going on demonstrations and banging pots and pans. Why have the rest of the Western countries not even heard about it? Pressure from Icelandic citizens’ has managed not only to bring down a government, but also begin the drafting of a new constitution (in process) and is seeking to put in jail those bankers responsible for the financial crisis in the country. As the saying goes, if you ask for things politely it is much easier to get them. This quiet revolutionary process has its origins in 2008 when the Icelandic government decided to nationalise the three largest banks, Landsbanki, Kaupthing and Glitnir, whose clients were mainly British, and North and South American. After the State took over, the official currency (krona) plummeted and the stock market suspended its activity after a 76% collapse. Iceland was becoming bankrupt and to save the situation, the International Monetary Fund (IMF) injected U.S. $ 2,100 million and the Nordic countries helped with another 2,500 million. Great Victories By The Sovereign People! Last Lap Dance For Rothschild: Iceland’s Viking Victory Over The Matrix Banksters! While banks and local and foreign authorities were desperately seeking economic solutions, the Icelandic people took to the streets and their persistent daily demonstrations outside parliament in Reykjavik prompted the resignation of the conservative Prime Minister Geir H. Haarde and his entire government. Citizens demanded, in addition, to convene early elections, and they succeeded. In April a coalition government was elected, formed by the Social Democratic Alliance and the Left Green Movement, headed by a new Prime Minister, Jóhanna Sigurðardóttir. Throughout 2009 the Icelandic economy continued to be in a precarious situation (at the end of the year the GDP had dropped by 7%) but, despite this, the Parliament proposed to repay the debt to Britain and the Netherlands with a payment of 3,500 million Euros, a sum to be paid every month by Icelandic families for 15 years at 5.5% interest. The move sparked anger again in the Icelanders, who returned to the streets demanding that, at least, that decision was put to a referendum. Another big small victory for the street protests: in March 2010 that vote was held and an overwhelming 93% of the population refused to repay the debt, at least with those conditions. This forced the creditors to rethink the deal and improve it, offering 3% interest and payment over 37 years. Not even that was enough. The current president, on seeing that Parliament approved the agreement by a narrow margin, decided last month not to approve it and to call on the Icelandic people to vote in a referendum so that they would have the last word. Remember on September 12, 2009 +2,000,000 Americans Marched Upon Washington & MSNBC said it was only 50,000 at most? Why Was That? The bankers are fleeing in fear Returning to the tense situation in 2010, while the Icelanders were refusing to pay a debt incurred by financial sharks without consultation, the coalition government had launched an investigation to determine legal responsibilities for the fatal economic crisis and had already arrested several bankers and top executives closely linked to high risk operations. Interpol, meanwhile, had issued an international arrest warrant against Sigurdur Einarsson, former president of one of the banks. This situation led scared bankers and executives to leave the country en masse. In this context of crisis, an assembly was elected to draft a new constitution that would reflect the lessons learned and replace the current one, inspired by the Danish constitution. To do this, instead of calling experts and politicians, Iceland decided to appeal directly to the people, after all they have sovereign power over the law. More than 500 Icelanders presented themselves as candidates to ­participate in this exercise in direct democracy and write a new constitution. 25 of them, without party affiliations, including lawyers, students, journalists, farmers and trade union representatives were elected. Among other developments, this constitution will call for the protection, like no other, of freedom of information and expression in the so-called Icelandic Modern Media Initiative, in a bill that aims to make the country a safe haven for investigative journalism and freedom of information, where sources, journalists and Internet providers that host news reporting are protected. The people, for once, will decide the future of the country while bankers and politicians witness the transformation of a nation from the sidelines. Nazi Muffin Rothschild ~ In The Middle Of 2015’s Banker’s Battle For The Bulge! The Reset: Exorcism Of The New World Order ~ The Laudato Si. 132 Nations Join To End Rothschild Banking Jig aka; NWO: The Secret He-man Mutual Appreciation Economy! President Of Iceland Ólafur Ragnar Grímsson Arrests 10 Rothschild Bankers. Obama’s 25 Charges Of Treason: Where’s Darrel Issa? The dominoes are beginning to fall as the global economic outlook deteriorates and reality sets in, both for international banks and nation states. For Rothschild, The Silver/Gold Fix Came to Fruition in 2005 ~ The Only Ones Left On The U.S. Field Of Deception Were The American Taxpayers. Ultimately, Through Crony Politics, The American Taxpayer Was Forced To Pay For Massive Bail-Outs  To The International Banking Cartel To Fill In Rothschild’s Bilking Debt Hole Of The U.S. Economy. London [aka;Rothschild] gold-fix banks accused of manipulation in U.S. lawsuit. RollingStone ~ The Fed’s aka; Rothschild’s Magic Money-Printing Machine: Usurping U.S. Gold Backed Currency! RollingStone ~ “Conspiracy Theorists Of The World, Believers In The Hidden Hands Of The Rothschilds, We Skeptics Owe You An Apology.